Finding a pipe rehabilitation company in Florida that is experienced in manhole rehab but also pipe rehabilitation can be difficult. First of all, there are many technologies offering solutions for pipe and manhole repair. We offer cured-in-place and epoxy pipe rehabilitation, and manhole rehab through the application of a concrete polymer paste from Epoxytec. With large diameter pipe rehabilitation for example, cured-in-place (CIPP) pipe will be installed along the straight lengths of pipe but Epoxytec is used to rehabilitate the bends because of its superior adhesion to all types of surfaces, including the liner itself. This multifaceted rehabilitation capability is only offered by a few very large pipe lining companies, and as a result they can demand very high installation rates. By partnering with specialist smaller firms we are able to outbid most of the large companies and still use more expensive superior products. 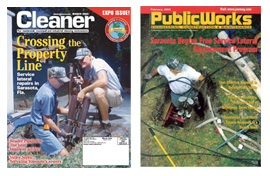 Our manhole grouting and pipe grouting and pipe lining have a 100-year life span and has been tried and tested by cities and private entities across Florida in cities such as Miami, Tampa, Sarasota, Boca Raton, West Palm Beach, Orlando, Sarasota and Naples. Epoxytec is a two component moisture insensitive, highly adhesive, chemical resistant solid strength epoxy paste with outstanding adhesion. 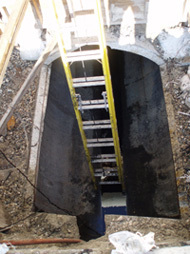 It bonds vertically to the manhole and overhead in pipe rehabilitation. Ideally suited to manhole rehabilitation as it bonds ot concrete, steel, stone, wood, brick and many other materials. It is applied by trowel and will not sag and has great chemical resistance. All that is required for a good bond is thorough jetting, pressure washing or sand blasting. Despite its strength, Epoxytec has some flexibility and will not crack easily due to settlement or other movement. For the applicator, this type of manhole rehabilitation is pleasant as no dangerous volatile solvents are involved. For manhole rehabilitation we partner with and Epoxytec certified installer which works throughout Florida, our main territory. 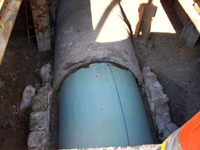 City of Tampa: Scope of work: Pipe lining, concrete repair and rebuild – hand-laid sectional and structural epoxy pipe liner at the 90 degree bend. Epoxytec Certified Contractor: Vac-Vision Environmental, LLC. Certified contractor, Vac-Vision Environmental paired with Epoxytec to assist in a pipe lining project for Insituform Technologies® and the City of Tampa at their Howard F. Curren Advanced Wastewater Treatment Facility. The main influent pipes, 72 inches in diameter, have the capacity to bring in 96 million gallons of wastewater per day. With this kind of high erosive flow and chemical corrosive attack of the concrete, there is no doubt a high performance liner would be needed in order to rehab, improve, and protect the structure in this environment. 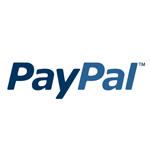 A number of considerations go into a product recommendation for this kind of project. 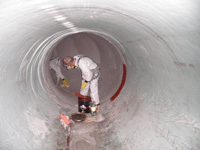 For one, the scope needed to be understood in its entirety considering that Insituform needed to approve the Epoxytec solution as a tie to their in situ sewer-grade CIPP (cured in-place pipe). At the 90 degree bend in the pipe, the Epoxytec material had to be proven to bond unquestionably well to the CIPP liner that was planned to be inserted. In addition, the material needed to be structural, and intended as an in situ sectional liner to monolithically compliment the entire CIPP liner. Therefore, accessibility, ease-of-application, bond strength, structural/modulus properties, the “tie-in” factor, and the environmental and anti-corrosive protective attributes are just a few examples of some of the evaluating data reviewed. Epoxytec suggested the use of Epoxytec CPP and Epoxytec Uroflex. Both are 2-component, 100 % solids epoxy with no VOC’s (Volatile Organic Compounds) that are ideal for confined space and hard to reach areas, such as this application. With easy-to-use and uncomplicated logistical application methods – the material and tools were simply lowered into the opening approximately 30 feet below the surface and then carried almost 300 feet down the pipe where most of the work actually took place. The straight sections of the pipe lining was completed by Insituform Technologies® using their proven CIPP liner; to facilitate a monolithic system at the 90 degree bends of the pipe, Insituform consulted with Epoxytec for a sectional complimenting lining system. The solution that would “tie-in” to the CIPP liner was Epoxytec CPP. 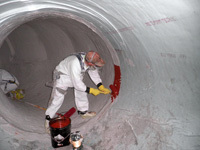 The CPP epoxy is the perfect solution because its adhesion is remarkable, especially to concrete and other materials with little preparation and it has a structural compressive strength of 16,000 psi. 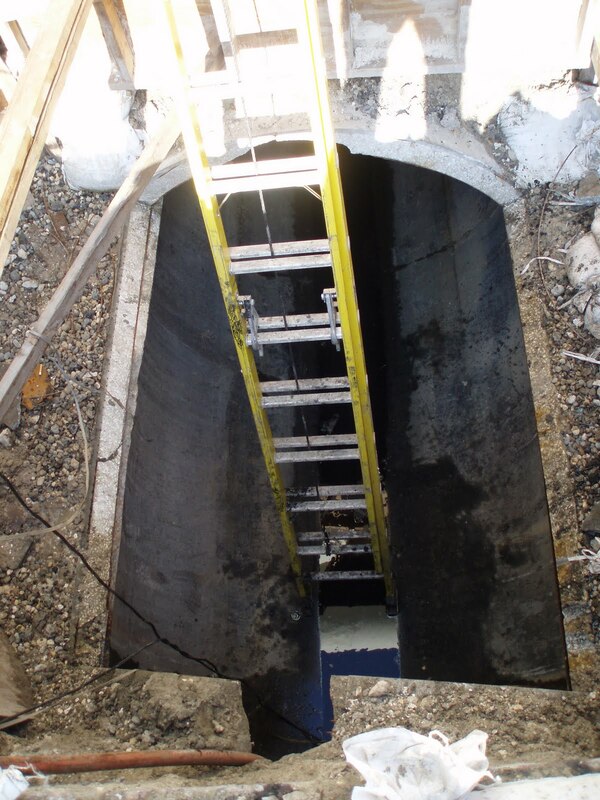 Exterior and interior photo of the 72″ rehabilitated pipe. High flow rates and H2S attack pose a threat to wastewater pipe lines on a continual basis. Not only does Epoxytec CPP perform against these threats, but the ease of application plays a big role as well. Epoxytec CPP can be mixed by drill, troweled onto the surface and can be applied to 100% moisture saturated surfaces; ideal for underground water pipes that are inaccessible for the most part. To further combat against deterioration of the pipe, especially at the seams, Epoxytec Uroflex was utilized for its extreme chemical resistance and its flexibility to allow for movement of the pipes. At the seam, anticipated movement will be bridged with Uroflex because of its 38% elongation feature. This product can also be mixed by drill, applied by brush or roller and “ties-in” to Epoxytec CPP as if it were one unit system. 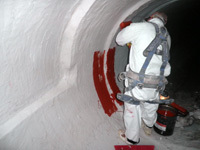 When completed, a uniform coating on the laterals and into the bends was achieved. This will ensure the pipe is completely sealed and that there are no breaks in the coating along the entire pipe, an important aspect of a main influent pipeline repair that it needs to be repaired and lined in one shot.